All move sets shown are at least as good as the worst Pokemon shown. Each infographic is designed to be printed on 8.5 by 11 paper. Pokebattler prides itself on high-quality infographics and being the go-to source for the latest and greatest raid research. 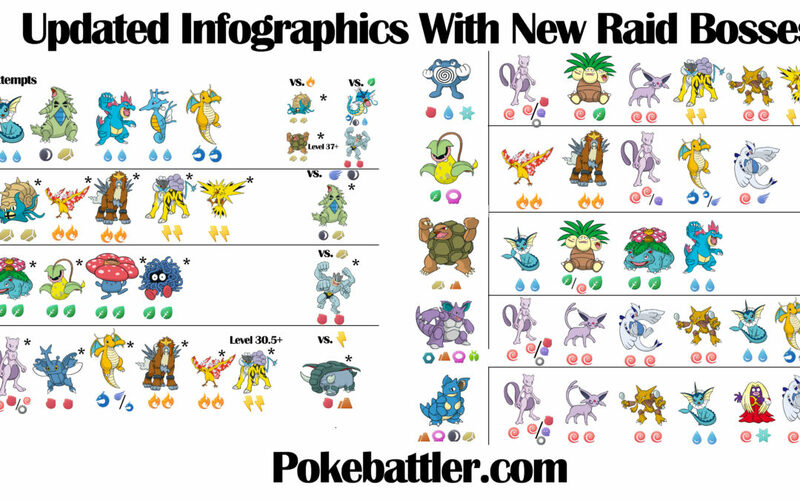 We have been making infographics for awhile now, and decided this week would be a great week to update all the infographics to the latest style with the latest research and the newest Pokemon available. We figured having a consistent look and feel for all the infographics would help everyone. There have been numerous improvements to the simulators in the last few months and tons of new Pokemon are now available. We’ve also learned a lot since we started making these, and try and show the important move sets and breakpoints in an easy to understand way. wWe were almost done and about to start writing an article about it, then Niantic dropped a bomb. New Tier 3 and Tier 4 raids for everyone! I got home from the hospital from visiting my mother (she’s fine thanks for the concern) and started scrambling to put together an update. The code for detecting which tier a raid boss belongs to is buggy, but a quick hack and that was resolved. New Monte Carlo sims were kicked off for higher quality results. A major restructuring of the raid info page and some help text later and the release went out. Woke up and realized now my wife and I have a ton of work to do. Hours of spreadsheets and micro manipulations of icons later, we’ve got it together. Hope you all enjoy! 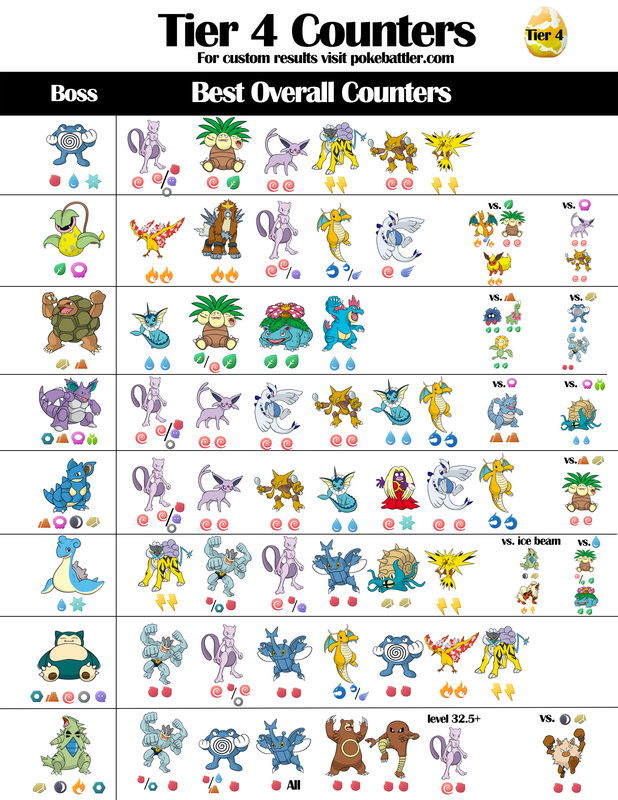 We didn’t bother with an infographic, but quick shout out to the psuedo-tier 3 (but actually tier 2) raid boss Cloyster. This high defense monster is best taken out with Raikou, Machamp, Mewtwo and Tyranitar. 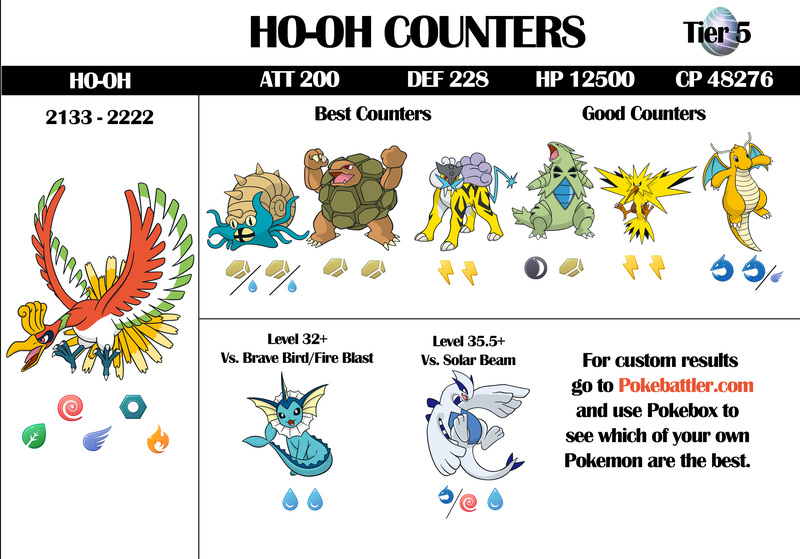 Poliwrath, Zapdos and Jolteon can help out if you are short. All current tier 3 bosses are solo-able except for Solar Beam Ninetales making it a good challenge for the high level players out there. 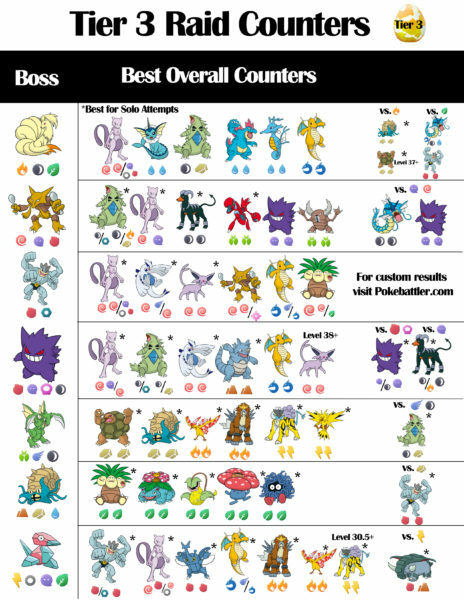 Ninetales is the hardest of the tier 3 bosses, with its fire moves just barely solo-able with legacy Omastar and double rock Golem. If it is packing Solar Beam however, it is borderline impossible with a rare theoretical kill coming from 6 perfect Mewtwo. Good luck with that ;). 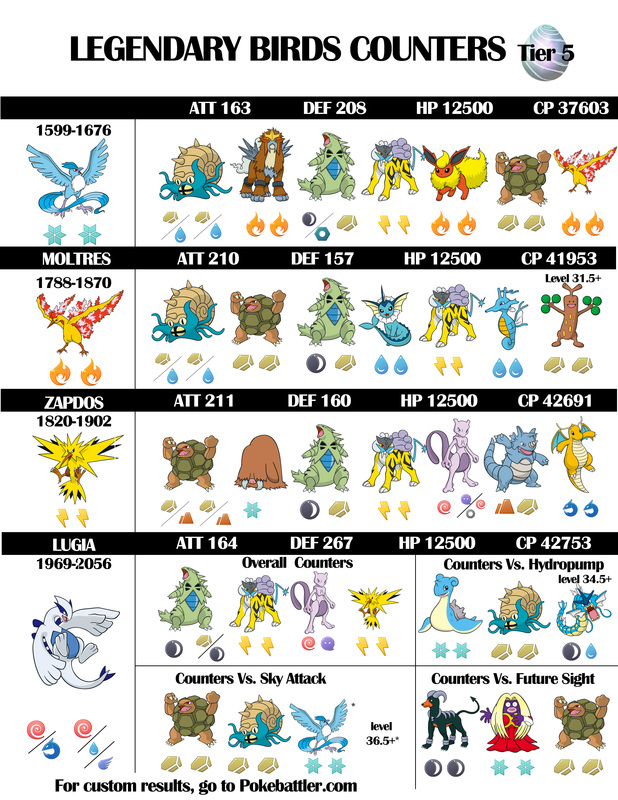 The fire combinations for Ninetales will all pose a significant challenge to those looking for a tough fight. I expect to see a video kill sometime this week. This bug Pokemon is a fairly easy solo with its vulnerability to rock combined with the high DPS of Golem. Other good options are any of the fire or electric legendaries. Tyranitar is usable as well unless Scyther is packing X-Scissor, in which case he’s too squishy to make the list. This tough octopus snail thingy would likely be the most difficult of the new tier 3 Pokemon except for its double weakness to grass. Almost anything with solar beam will handle it nicely. Omastar is definitely a Pokemon you want one or two of, as it is the best choice for fighting Pokemon with fire moves. 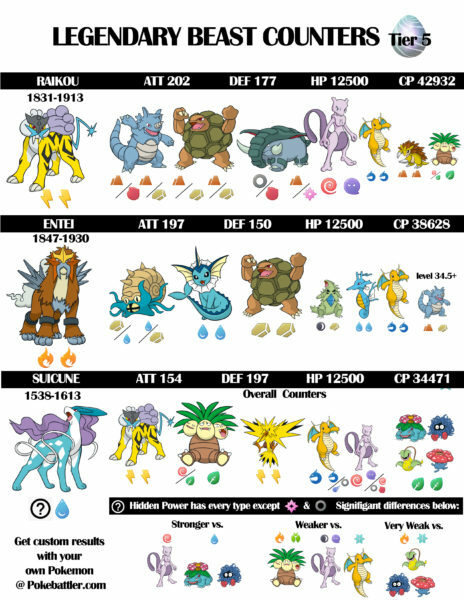 I expect with an upcoming move reshuffle, double rock Omastar will surpass Golem as the best rock Pokemon in many cases. This useless Pokemon looks cool and is easily defeated by almost anything. Machamp, Dragonite and the good legendaries all crush it. Donphan can theoretically solo a double electric Porygon for the adventurous trainers out there. The new Tier 4 raids help bring some variety to the raid scene, but unfortunately, no Dragonite was added at this time. He has only shown up as a raid boss for events so far. This Pokemon has some interesting matchups with the grass and poison options. After you have chosen your Moltres, Entei, Mewtwo, Dragonite and Lugia you need to know which special move Victreebel is packing to fill out your group. If it is poison, you want your Psychic attackers. If it is Grass, you want your weaker fire types and Exeggutor. Nidoking is totally useless and vulnerable to all the good Psychics. You can use Vaporeon and Dragonite too. 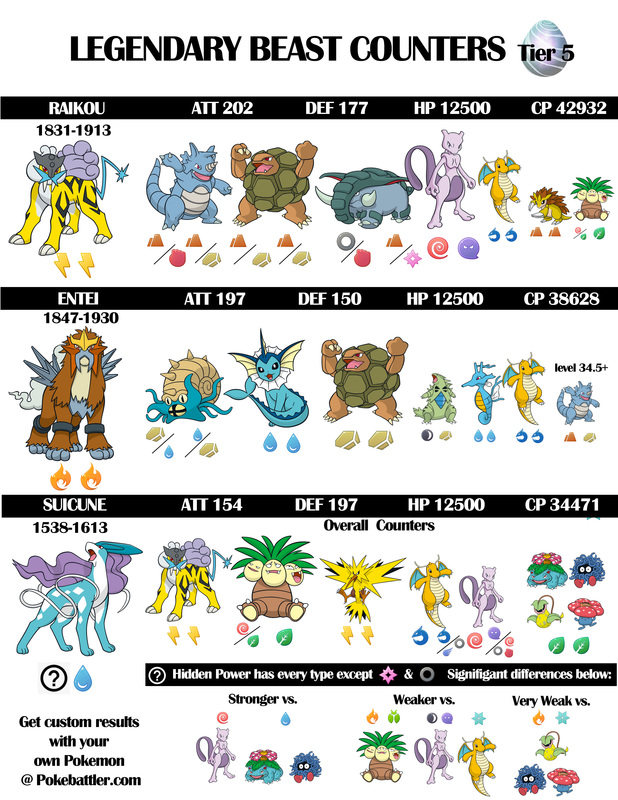 If he is packing poison moves, Rhydon and Omastar can be used for filler. The equally worthless Nidoqueen is also vulnerable to all the good Psychics. Its even vulnerable to Jynx if you happen to have a high level one. While currently only 1 legendary beast is available in each region, there have been incidents of other raids showing up for a short time. I hope these infographics are helpful to everyone. 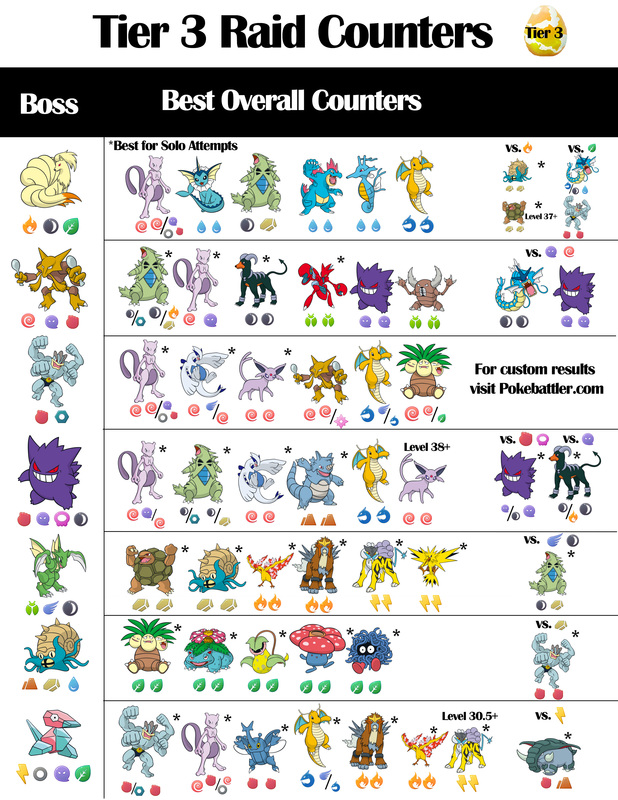 As always, for custom results, check out Pokebattler.com and use Pokebox to see which of your own Pokemon are best. Pokebattler is eagerly awaiting Gen 3 and tirelessly working on new features such as Power Up Suggestions and 6 Pokemon Raid Simulations. Thanks for reading, and happy hunting! 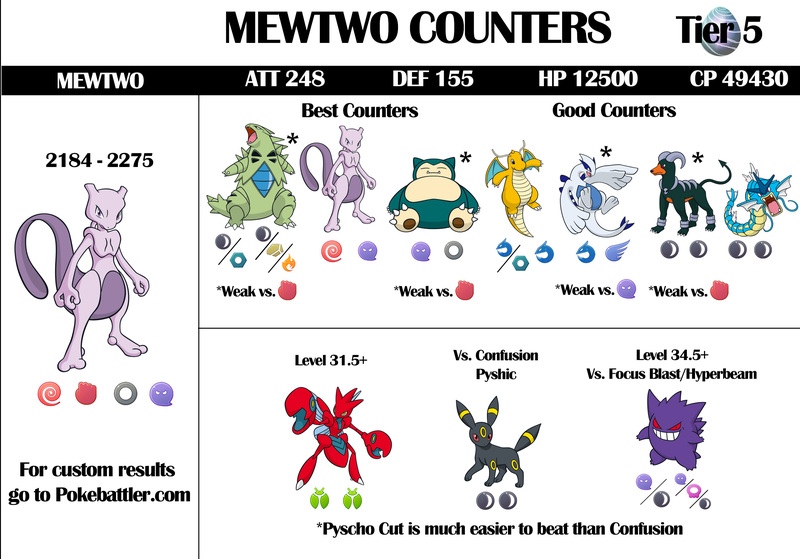 Against Porygon, you list Machamp with Steel charge move preferred over Fighting- surely this should be reversed? Explaining Hidden Power on Suicune, you say it can’t be Dragon type (or Normal)- it can be Dragon, but not Fairy. Thanks! Will get these fixed. Any chance the max cp’s could be added to the 3’s/4’s? I save these under the photos folder on my phone and for those I don’t raid as regularly I keep having to look up what the max is elsewhere if I think it looks good. There isn’t really space on the infographic the way it’s designed. I could ask my wife but I’m afraid of her response:) There are other infographics with that info floating around though. Can there be an update to include weather plus possible gen 3 counters? This would be a lot of work. We will see if we can get to it. For now, I would use our raid tool which supports what you are looking for.